An iron mordant is used to “sadden” a natural dye- make it darker or muted. But it’s also used to transform a dye into a different color. With Phaeolus schweinitzii, alum mordant will give you gold. Iron mordant will give you green. I don’t often use an iron mordant for a few reasons. First, I’m sensitive to chemical smells; alum will give me a headache, I feel worse with iron. Second, this is a more hands-on mordant; I was taught that the fiber needs to be frequently (gently) stirred and kept underneath the water to help prevent uneven dyeing. Using glauber salt and cream of tartar with the iron will help. I’m not a fan of standing near a chemically smelly pot frequently stirring for about an hour. With all that said — I love the results of an iron mordant. Note the various shades of green. 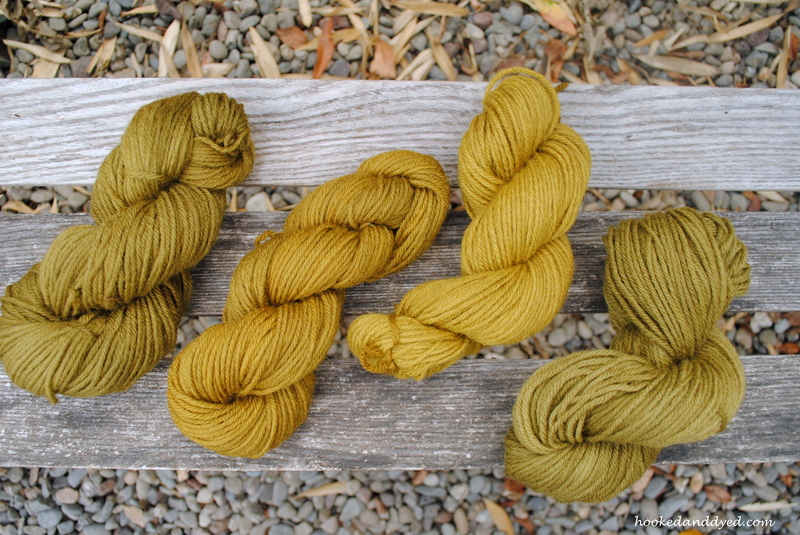 While some yarn turned a forest green, the other skeins were more olive green. When I did this mordant, I used two different stainless steel pots. In one pot the water and yarn turned a typical brownish hue. However, in the other pot the yarn turned a greenish hue. The result of using old mordant? My error in calculating mordant ingredient proportions? My question as to why I had two distinct shades of green was still muddling around my mind when my Mom (Dorothy Beebee) and I recently taught a dye workshop. The yarn she mordanted with new iron mordant was brown, and when the students added it to the Phaeolus dye it went instantly deep green. Aha! It wasn’t me – it was the mordant! 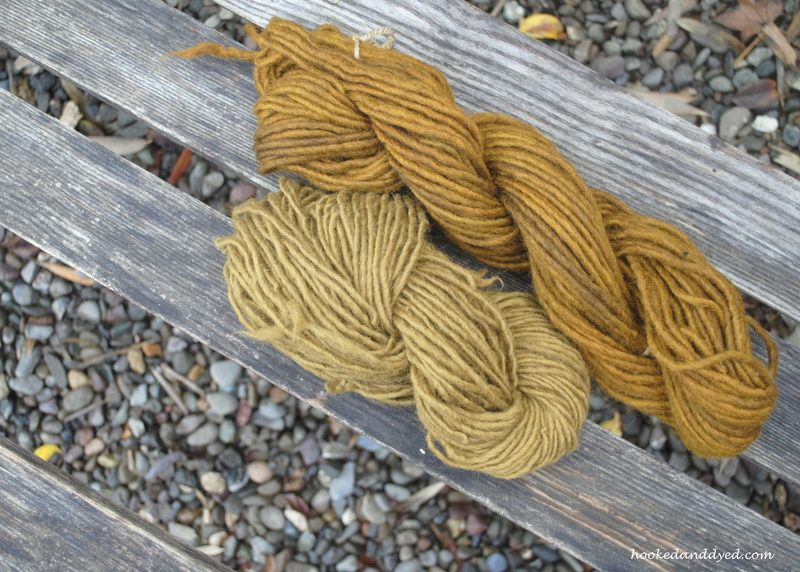 When I used the skein in a new Phaeolus dye I did not achieve a saturated green. It started off pale yellow, and slowly, gradually turned greenish- but it looked liked it was having a difficult time making the transition. 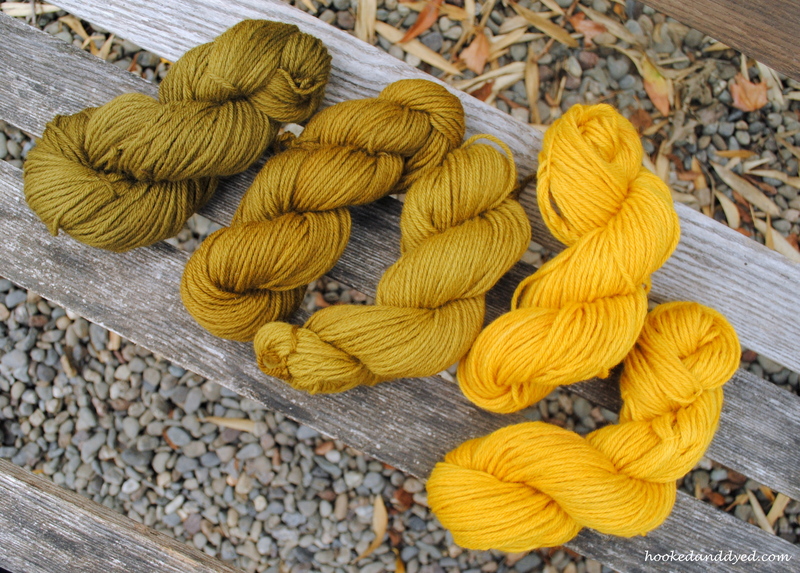 The second skein refused to turn green and instead settled on yellow-brown. New mordant, perhaps not enough mushroom? If I had paid attention to the quantity of mushroom I tore up, instead of mindlessly throwing it into the pot, I’d know for sure. Dyeing is equal parts science and art. I need to work more on the science. Hi! I’ve never used mushrooms for dyeing, but with other natural dyes, the few times I use iron, I throw it to the pot only the last five minutes and it works well for me. I’ve read somewhere that a long bath with iron spoils wool (easily noticeable on very fine merino, for example). You could give it a try! Hi Laia! I’ve heard about adding the iron at the end, and skipping the pre-mordant process. I usually pre-mordant because I learned that it helps fix the dye to the fiber (at least it does with alum), which increases the light fastness. Not sure about iron… I need to try this, because you’re right- iron can weaken the wool fibers. I noticed that when I did this dye with alum mordant, in a pot with a rusty spot on the bottom, the gold wasn’t as bright, a bit muted. I haven’t noticed a difference with the iron mordant.